Apteka is one of Australia’s most innovative, high quality and progressive hair and scalp products, offering natural formulations to address major hair and scalp concerns. Developed by a leading hairdresser with over 30 years experience in conjunction with a therapeutic and natural botanical manufacturer and entirely Australian made and owned, Apteka products offer a true alternative to synthetic and mineral based ingredients, using only the highest quality essential oils, vitamins, botanical extracts, essential fatty acids and combining active ingredients and peptide technology with maximum safety and effectiveness, so you get results you can see and feel. Apteka is constantly improving and seeking better and safer alternatives, so customers can benefit from Apteka's ongoing research and development. All bottles and packaging are recyclable and ingredients are biodegradable. 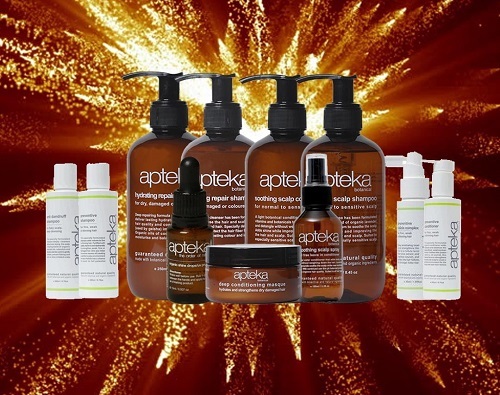 Apteka do not test or support animal testing and are listed on the cruelty free web site. Apteka products are used and recommended by leading Trichologists.